The usual back-to-school buzz is a little louder this year at the University of Toronto Mississauga, as preparations continue for a larger than average incoming class this September. An additional 600 students – both international and domestic – are expected to join the U of T Mississauga community this month. While this creates a larger incoming class, campus departments are working to ensure that services and resources will be ready. New students will have the chance to check out the soon-to-open new North building, a 210,000-square-foot, six-storey facility at the northern edge of campus. 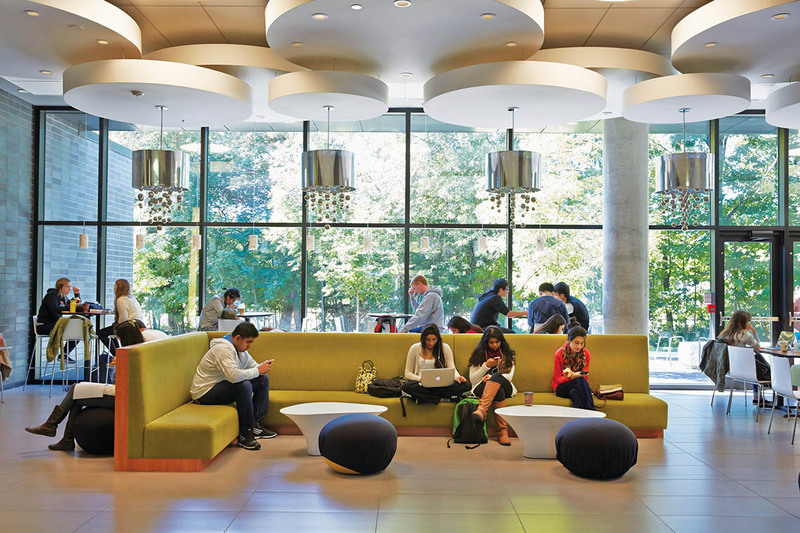 Designed by Perkins+Will, the building features 29 classrooms and more than 500 study spaces. Additionally, a new administrative building is slated to open in the spring of 2019. The registrar’s office is expanding hours for academic advising over the next few weeks, and more sections and spaces are being added to courses to account for the increased numbers of students. Students can also take advantage of extended study hours at the Hazel McCallion Academic Learning Centre, an expanded study space website and extra printing locations around campus. To ensure that eligible incoming students can take advantage of U of T’s first-year residence guarantee, some residence rooms have been converted to double-occupancy, and preparations were made to deal with a larger number of students on residence move-in day. University staff are also ready to help connect students with appropriate off-campus housing options. Campus Police services are also adding new officers to provide a safe and well-patrolled campus. To assist with challenges that may arise, the International Education Centre has extended immigration advising hours, additional transition support activities are available to help with the natural anxieties of new situations, and more staff are being hired to help with the TCard system. If needed, the university will add more shuttle buses to the services currently offered between U of T Mississauga, the downtown Toronto campus and Sheridan College’s Trafalgar campus, which partners with U of T Mississauga on joint programs. If high ridership is noted on the Brampton Transit express bus service, the university will explore options to help as well. Students will also enjoy expanded food options at several new eateries around campus. Starbucks is extending its hours, and several food services are shifting to the Instructional Centre. A new Grab ‘N Go coffee shop will open in the new North building, and students can access several new specialized vending machines, including hot cocoa, leaf tea and ice cream.